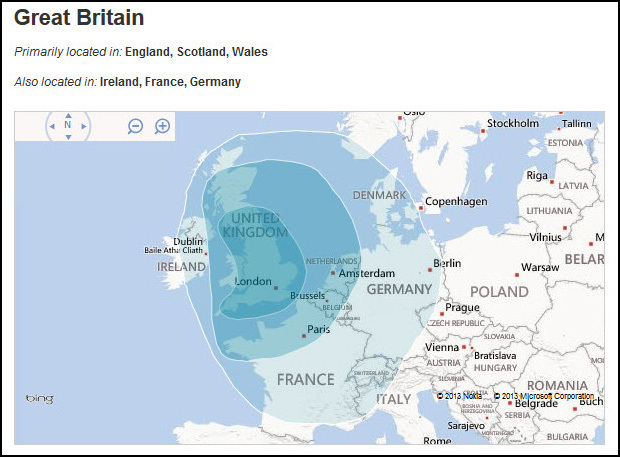 AncestryDNA rolled out its new Ethnicity Estimate Preview to some 6,000 of its autosomal DNA customers for a first look yesterday, with a broader rollout to all customers within the next month or so. As you can see in this graphic, they are far more detailed, with many more regions being reported separately than in the existing estimates. A total of 26 regions — nine in Africa, three in Asia, two in the Pacific Islands, two in West Asia, one for Native American ancestry in North and South America, and nine in Europe — are included in the new estimates. One regional breakdown of particular use to African Americans is the division of West Africa into six regions: Senegal, Mali, Nigeria, Ivory/Ghana, Benin/Togo and Cameroon/Congo. Another genealogically-useful breakdown is that of the British Isles, which now separately reports Irish ethnicity. Yet another is the division of Southern Europe to separate the Iberian peninsula from Italy and Greece. AncestryDNA has moved away from relying on public databases for its reference populations for each region — those persons found in the region now whose genetic makeup is expected to be close to the historical DNA for the area. It is now relying primarily on data for reference populations drawn from the samples collected by the Sorenson Molecular Genetic Foundation, whose DNA assets were acquired by Ancestry in 2012. Some 3000 reference samples worldwide from the 26 regions — anywhere from a low of 16 to a high of 645 people all of whom were born in the region and who have all four grandparents who were born in the region — were used for purposes of comparison after being carefully vetted for genealogical accuracy. More of the overall test sample — roughly 10 times as much — is being analyzed against the reference populations, and analyzed repeatedly to arrive at an average, which is the number reported for that region. There is an enormous amount of background information available in contextual help, where you can find out more without ever leaving the page with your results. The help ranges from simple explanations of what’s being presented all the way up to a highly technical whitepaper that would make the head of a statistician spin. And although AncestryDNA continues to present its results on the opening page as straight percentages, it’s taking a couple of important additional steps to try to drive home to its customers that the percentages are just estimates, not carved in stone. First, as you can see here on the right, when you click on each specific result — here my 49% Great Britain result — the box opens up to display the actual range of results seen in various parts of your DNA when compared to the reference population. And what the range says is that, even though I average out at 49%, I could actually have as little as 22% of my DNA in common with the British reference population — or as much as 76%. Second, as you can see below, although AncestryDNA reports that its Great Britain results are found in persons “primarily located in England, Scotland and Wales,” it makes it clear that the same DNA signature can be found in lower concentration in Ireland, France and Germany, plus Belgium and the Netherlands, and — if you follow the circles all the way out — in lower concerntrations still in Switzerland, and parts of Italy, Austria, the western part of the Czech Republic and Denmark. Overall, the combination in the new estimates of more regions, more carefully selected reference populations and more analysis tends, in most cases, to bring the results pretty much in line with the Ancestry Composition results of 23andMe, considered to be — at the moment — the industry leader in these sorts of ethnicity estimates. The bad news is, that’s only true in most cases. For others, the new estimates are — at best — a mixed bag. As with anything that relies principally on extrapolating data through statistical analysis, some results are going to change in ways that are jarring compared to the paper trail even as perhaps the majority of results move closer to the paper trail. Particularly for people with large percentages of German or French ancestry, the update is a real disappointment. From what I can see, the reference populations simply don’t distinguish those populations well at all, and it appears that many results formerly reported as Central European are now being lumped in with either Great Britain or with Scandinavia. AncestryDNA’s vice president for genomics and bioinformatics, Dr. Catherine Ball, reported in a conference call yesterday that the most difficult populations to differentiate were the French, German and English populations because of centuries of wars and intermingling between the continent and the British Isles. She also noted that there wasn’t enough information available yet to confidently detect differences between German and French ancestry. Dr. Ball also said it wasn’t possible given today’s scientific know-how to say just how far back in our individual history our ancestors may have been British or Scandinavian or Irish. The comparisons are being made against persons alive today whose own ancestry can be traced back to great grandparents living in the region from which the reference population was chosen. But a mass invasion 500 years ago would inevitably skew the results. And AncestryDNA’s Dr. Ken Chahine added that the word “estimate” for these results had been chosen very deliberately. “We have a lot more we want to learn, and areas where we know we can continue to improve,” he said. I have heard from a few Scots that the new Irish may mean Scottish OR Irish. I haven’t seen that as yet, Rebekah, and am still shaking my head over my own results (my Germans have disappeared and, unlike everyone else whose Scandinavian percentages went down, mine doubled — and I have no Scandinavian ancestry). Judy, I had the same kind of results. My fathers family are from Germany and my mother’s are from England and Scotland and my DNA results came back 50% Scandinvian! Don’t uderstand that at all. It’s a problem with the reference populations. That actually makes some sense to me, Rebekah. My results went from 78% British to 60% Irish, 9% British. I expected some Irish but since my mother’s tree is all colonial American, I did not expect 60%. 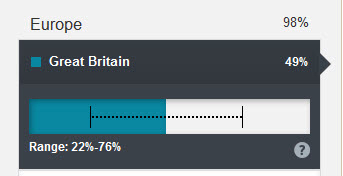 If Scots comprise some of that 60%, then that would be an explanation for the high percentage. I look forward to seeing the updated results when the rollout continues. Hope yours are better than mine, John. I am hoping the mysterious 8.46% “Middle Eastern” will be better explained. This is a total mystery to us, her family has been in America before the early 1800s and back to the 1600s. Keep in mind, these genetic signals could be telling us what our ancestry was thousands of years ago, and not at all within what we’d consider a genealogical time frame. Good article, Judy. Thank you. I am pleased with the updated results and look forward to comparing them to the results of my DNA cousin matches. Anything that can give me a clue as to where to look for a connection is helpful. In fact, I’d like to see the results narrowed down even further in existing areas (ie Ireland/Scotland, France/Germany) and expanded in areas where populations are not separated, such as the indigenous tribes of North and South America, or represented, such as the people of Siberia or the Sami of the Arctic Circle. Having Scandinavian DNA, I wonder if the Sami fit in. I never liked the “uncertain” category and am happy to have results with a probability range even if the probability is very low. I do question the size of some of the reference groups. Some seem too small to get an accurate reading for a whole population. For example, if you look at Polynesia, it shows a sample of 18 people. Most are 100% polynesian but “other regions commonly seen” shows 11% Scandinavian. With a sample of only 18 people, that could be one guy. Still, I’d rather have the information than not have it, and they do make it clear that the 11% figure could be due to the sample size. Overall, good improvements to AncestryDNA. I appreciate your article. Thanks, Pat. I also would like to see the narrowing of these results — but have my doubts that it will ever be possible where the populations are so very mixed (which probably means I’m doomed to be dissatified with my own results coming as I do from those very populations). And I also wonder greatly about the reference populations. My paternal/paternal/PATERNAL 2nd great-grandfather, (John) Owen Boyce came from Stranorlar, County Donegal, and his spouse, Bridget Laughrey (or any spelling combination to the surname, thereof) is said to come from Scotland (actual parish and county are unknown). Other records claim she was born in Ireland (actual parish and county are unknown). They, both, died in Saint-Elzear, Province of Quebec, Canada during the mid-to-late 1800s. Their son, my great-grandfather John Owen Boyce and his wife, Jennie Cecelia Connors (or O’Connor), were both born in Saint-Elzear and Saint-Sylvestre during the early to mid-1850s, respectively. Both moved to Websterville, VT in August 1896 (just three miles from my home, here, in Barre, VT). My paternal/paternal/MATERNAL 2nd-greatgrandfather, James Connors (or O’Connor), also came from Ireland (County Cork, parish unknown), as did his wife, Rose Anne Burke (County Sligo). They moved to Quebec City during the early 1830s (where they were married), and, then, they moved 35 miles southwest to the Saint-Sylvestre area (later to be known as the Saint Severin area) of Quebec Province, Canada. After the death of James Connors, my 2nd great-grandmother, Rose Ann Burke Connors (O’Connor) moved with her family to Central Vermont area (to East Barre, actually, four miles from where I live in Barre, VT). My maternal/maternal/PATERNAL 2nd great-grandfather, Edward Joseph Tully, came from Ireland (actual parish and county are unknown), as did his wife, Mary Elizabeth Powers (Waterford County). They moved from NY City to Burlington, VT where they are, both, buried. My maternal/paternal/MATERNAL side, Edward Donal Gonyea and Elizabeth Sweeney, came from Quebec Province. Both 2nd great-grandparents were French Canadian (parishes unknown), and both settled in Saint Albans, VT, just 25 miles north of Burlington, VT.
My mother’s paternal-grandfather, Frank Simons (or Simmons), was thought to be Scotish. His descendants came from Connecticut, during the 1600s, before moving to Lisbon, NH (where he is buried). His spouse, Julia Richard (or Richards) was French Canadian and born in Hatley, Province of Quebec (burial location and date unknown). The family resided in several communities of Vermont, primarily in Stannard, Wheelock and Greensboro, VT.
My mother’s paternal/MATERNAL grandparents, Winfield Scott Gatchell and Josephine Vance, were born in Brunswick, Maine and Nova Scotia, respectively. Both were of Scots descent. Both moved to Montpelier, VT (just 8 miles from my location in Barre, VT). Yet, strangely, there are no indicators or actual markers from Ancestry.com/DNA which claim I have Irish heritage. Is something amiss with the Ancestry.com/DNA “science,” or am I incorrectly reading the information provided me? I thank you, in advance, for any reasonable explanations. 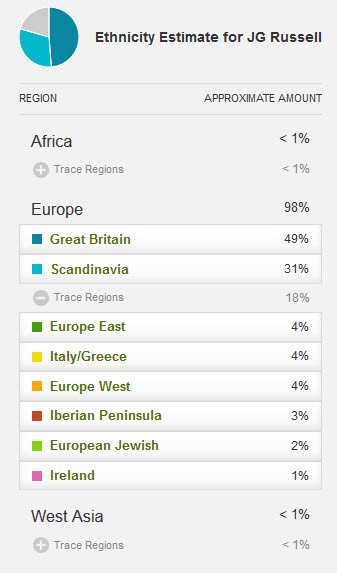 Tom, on your AncestryDNA results page, in the upper right, do you see an orange box with white lettering that reads “NEW Ethnicity Estimate Preview”? If you do, then you need to click on that to see the new estimate. If you don’t, then your new results haven’t been rolled out yet and you can expect then sometime within the next month. The results you’re reporting CAN’T be the new ones, since there is no Central European category in the new results. Thus, I guess I will just have to wait a little bit longer. Thanks for the update, Judy. A bit longer, yes. When that orange button appears under the green BETA button, you’re good to go. Thank you for this explanation using your results. I am hoping that my “100% Central European” results will be a bit more defined, considering the number of English, Irish, Welsh, and Scottish ancestors in my history. I have to say that getting those results was more than a big disappointment to me. And the resulting “matches” of one third/fourth cousin and then over 4800 more distant matches were a complete waste of time and expectations on all of our parts. Your results should be much more refined, Kate, but let me suggest that you NOT think of your close or distant cousins matches even in the same page, must less the same sentence, with these admixture results. Admixture is likely to be a rough approximate picture of your distant ancestry, not the ancestry you and those cousins might share. With the possible cousins, you need to look ONLY at the places where your known ancestors and their known ancestors were living at the same time. Forget surnames, forget German-French-Welsh. If your family and a match’s family were both, say, in Cherokee County, Alabama, in 1840, that’s what you look at. The rest is window dressing. I’m a direct descendent of Fred Flintstone, with a mixture of Martian DNA from Area 51, a splash of Moon green cheese, and a dash of stardust. You should lose the uncertain part. Whether they pick up the Martian, well, let’s just say I have my doubts! The irony is that the “uncertain” portion could turn out to be made an amalgam of dozens of races or animals. I’ve really been hoping I’m at least 1 percent Sus scrofa. This would make my day. I wish you luck on that one! Snort snort . . . Received my updated AncestryDNA results yesterday. Thanks to your article, I wasn’t expecting the approximately 10-12% each French and German to show up, and was expecting to lose a fair amount of British to Scandinavian. Some of the new areas were a surprise. Before the AncestryDNA update, it told me I was 88% Central European and the rest was Eastern Europe and now since the update it says I’m from all the way over in Ireland and England. I’m furious honestly, since the new update, it’s erased all that I had and now it says I’m almost 100% British, all on the opposite side of the map with absolutely no trace of Central European or Eastern European in me anymore. I’m going to use the Geno 2.0 now. Kitta, there’s no reason to be furious — it’s just a fact of life that the science isn’t there yet. These percentages are — I repeat — not the real reason to do autosomal testing. We do autosomal testing to test our theories about our families and to find living cousins we might not otherwise connect with to share genealogical data. The shortfalls of these admixtures — these numbers — are insignificant compared to what the tests really CAN do.